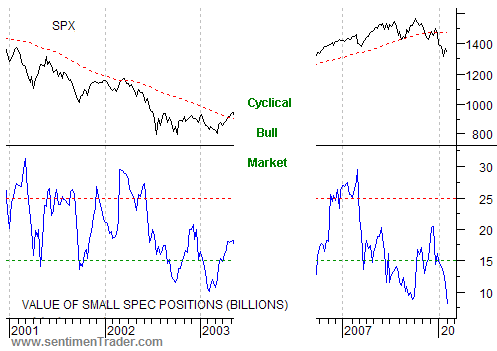 As promised in last week’s sentiment overview, here is the information and chart on the position of the retail futures traders (known as small speculators). The most recent Commitments of Traders report covers the position of futures market participants as of last Tuesday (February 5th, 2008) and it shows that on aggregate, the small speculators are very pessimistic about the stock market. As you can see on the chart above, this is lower than any time in the past few years. The only caveat I would throw into this wildly bullish scenario is that each time the retail futures traders throw in the proverbial towel, they do so at a slightly lower level. The only exception to this was the low in late 2006 which was around $14 billion - above the 2003 low. And the low in 2007 which doesn’t correspond to a rally. But after all is said and done, when we put this together with the horrible sentiment we’ve seen in the past few weeks, we get a picture of a market that is positioning for a bottom. Thank you for your blog, I found it very helpful and interesting indeed. But the “bottom” you mentioned in this article, do you mean it’s only for the short term or we’ll have a new bull market starting soon? Appreciate your work very much! I don’t have a crystal ball (I just pretend to) but if you put a gun to my head and forced me to guess I’d say intermediate term. In general, I believe that the retail investor is a reliable contrary indicator. However, I also have learned to question my own judgment when it comes to finding tops and bottoms. I am too much of a fraidy cat to explore this thesis with equity, but it might be worth using a neutral options strategy, such as a long straddle.